Infective endocarditis (IE) is a severe complication in patients with congenital heart disease (CHD). Epidemiology, etiology, and outcome in this group are different to those of patients with acquired heart disease. We reviewed all cases of proven and probable IE (Duke’s criteria) diagnosed in our center during the last two decades. We observed 45 cases of IE in patients with CHD (age range 8 months to 35 years); these represented 5.5 % of all the episodes of IE in our institution during the study period. The most frequent CHD were ventricular septal defect (31 %), tetralogy of Fallot (19 %), and atrioventricular septal defect (11 %). Twenty cases of IE (44 %) were recorded in patients with non-corrected native-valve CHD. Of the 24 patients with prosthetic-valve IE, post-operative acquisition during the first 6 months was confirmed in 11 patients (range 4–110 days). IE was community-acquired in 62 % of cases. Streptococcus spp. were the most frequent etiologic agents (33 %), followed by Staphylococcus spp. (32 %). Surgery was required to treat IE in 47 % of patients (52 % in prosthetic-valve IE and 41 % in native-valve IE, p = ns). In comparison to native-valve IE, prosthetic-valve IE was significantly more nosocomial-acquired (61 vs. 14 %, p = 0.002), presented a higher heart failure rate at diagnosis (39 vs. 9 %, p = 0.035), and developed more breakthrough bacteremia episodes (19 vs. 0 %, p = 0.048). Global mortality was 24 % (75 % in patients with prosthetic-valve IE who required surgery and 0 % in patients with native-valve IE who required surgery, p = 0.001). Multivariate analysis excluding breakthrough bacteremia (100 % mortality in this condition) confirmed that nosocomial IE [odds ratio (OR), 23.7; 95 % confidence interval (CI), 2.3–239.9] and the presence of heart failure at diagnosis of IE (OR, 25.9; 95 % CI, 2.5–269.6) were independent factors associated with mortality. Half of all cases of IE in patients with CHD occurred in patients with non-corrected native-valve CHD and two-thirds were community-acquired. Streptococcus spp. were the most frequent etiological agents. Patients with prosthetic-valve IE present a worse outcome, especially those requiring surgery. Breakthrough bacteremia, nosocomial IE, and heart failure are independent factors of mortality in patients with CHD presenting IE. Presented, in part, at the 50th Interscience Conference of Antimicrobial Agents and Chemotherapy (ICAAC), Boston, MA, USA, September 2010. 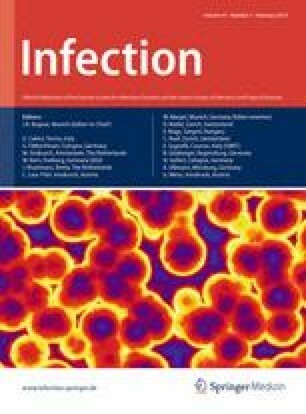 The authors of this manuscript have certified that they comply with the Principles of Ethical Publishing in Infection.